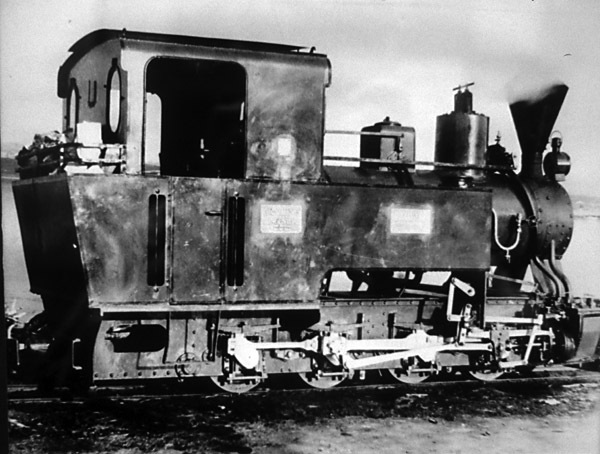 An 0-4-0T by Orenstein & Koppel of Berlin. Number and date unknown. I have been able to find no photos of this engine, despite looking through twenty or so pictures of prison railway locos. 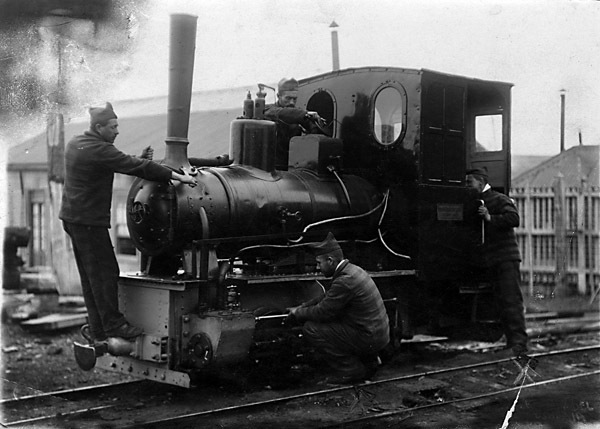 An unidentified Orenstein and Koppel 0-6-0T. Number and date unknown. This is probably the locomotive pictured below. This loco is sometimes labelled as the one known as 'La Coqueta' because of its tendency to bob and curtsey its way along the track. That would fit with the obviously very short wheelbase of this machine. 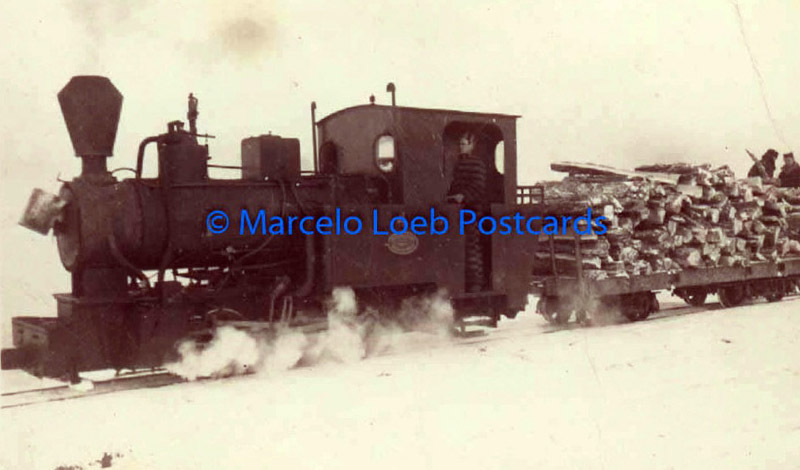 It is quite possible that this photo was mistaken for an 0-4-0T given the short wheelbase and wheels being hidden. This might have given rise to the suggestion recorded above, that the line had an 0-4-0T. The loco looks well-cared-for, and so it should with so much free labour! 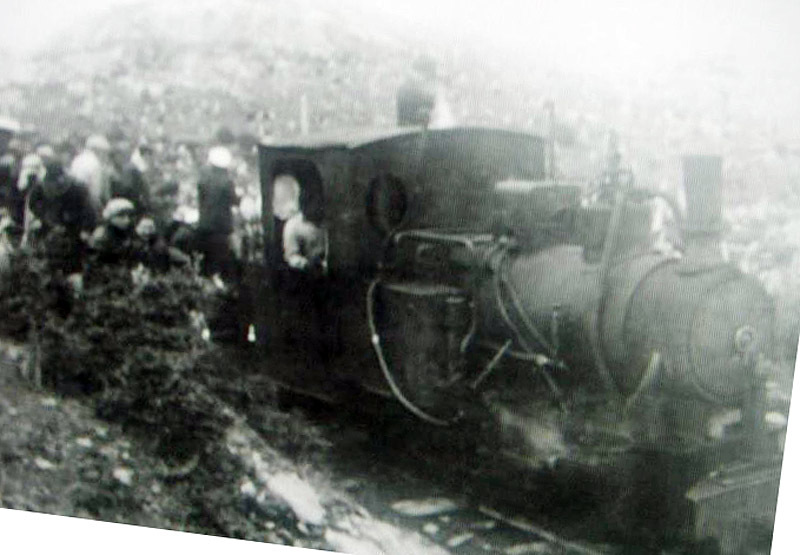 This picture is notorious for reasons unconnected with railways for two of the prisoners attending to the engine are the Leonelli brothers, who were sentenced to life in Ushuaia after murdering a total of twenty people. 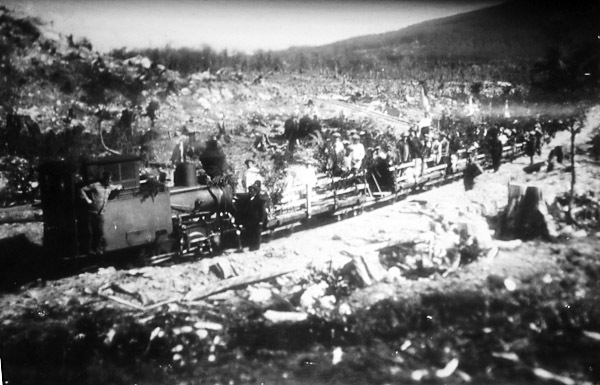 Below is a second photo of, I believe, the same machine, this time on a train of logs coming along the waterfront in the town. Two more 0-6-0Ts, also by Orenstein and Koppel. Nos. 4011 and 4012 of 1910, both of 20hp. These locos differ from that mentioned and pictured above, principally by their side bunkers and by their squat spark-arresting chimneys. The four next pictures show these locos. Whilst the paintwork changes from picture to picture and the cap on the chimney is not always present, these details are not sufficient to distinguish between the two engines. However, one of them eventually gained a rear bunker, not present in the other shots. One of the two 0-6-0Ts out in the woods with a large posed group. One hopes that the gentlemen standing on the engine's motion bracket found somewhere safer before the train moved. Note the spark-arresting chimney in this photo; it bears an extra cap in some shots. Note also the rear bunker, without the lining-out of the rest of the engine, which may be significant. Look also at the large timber wagons with side frames. A picture of a similar loco, though with a plainer paint scheme. All these pictures show wooden side-screens to the cab, very necessary in the climate. One other photo (on the previous page) shows merely a canvas screen to keep out the wind and snow. Perhaps that was an earlier photo before experience taught a lesson. There is something extra attached to the chimney top here. There is no rear bunker. A third picture of this class of engine, 'at the blacksmith's' the original caption said. This time the chimney's extra spark arresting top can be seen more clearly, and again there is no rear bunker. A final picture of this class of loco. This one is clearly labelled No. 2, and it does have the rear bunker! The original cut-out cab front can also be seen. It seems likely that the rear bunker was a later addition, possibly just added to one of the two locos. In the final picture above it is loco no. 2 which has the added feature. Since the sole surviving loco is so fitted, and is said to be no. 2, we can be fairly confident that this is correct. 0-8-0T Arnold Jung 3839 of 1928. This was a much later design, altogether heavier than the other locos. It can be easily identified in almost every photo by its rounded cab roof. A nice clear shot on the seafront in the town. Obviously someone has put a lot of effort into polishing the brass plates. Other features which help in the identification of this loco in less clear photos include the double roof, and roof overhangs turning down below the cab door top. The next shot shows the 0-8-0T propped up on blocks in a workshop. Whilst the plate in front of the doorway is the Arn. Jung builder's plate, the 'Lametal' plate represents the name of the Jung agent in Buenos Aires. Finally, a Henschel 0-4-0T that seems to have arrived late in the railway's life. The first image is dated 1947, the engine was clearly around during the last years of operation, but quite when it arrived is not yet known. 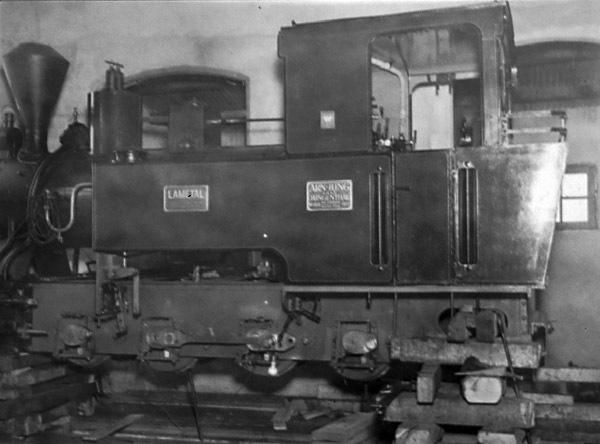 The second image suggests that the loco was fitted with a water-lifter, seen on the front of the right hand bunker. 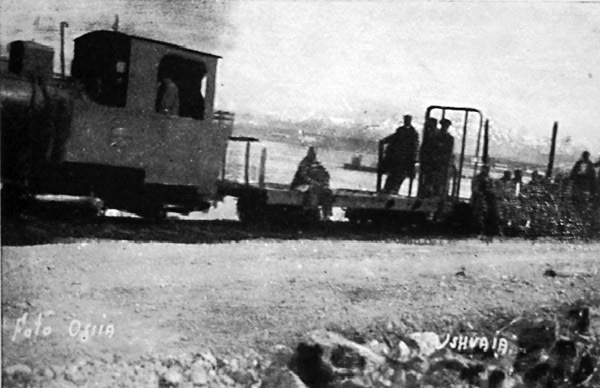 A recent correspondent has suggested that around 1940 the national roads administration used a railway in Ushuaia to construct a causeway from the town to the mission, and that this loco may have been imported for that purpose (2). A temporary railway would probably have been of 60cm gauge and might therefore have connected directly into the prison rail network. Certainly the men on the wagons look like prisoners. 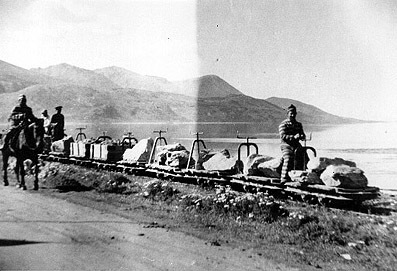 One source (3) suggests that in 1928 the prison railway system received two locos and several wagons after the completion of the FCCC extension work up in Chubut. However, apparently they could not be immediately used owing to minor gauge differences which took until 1935 to sort out. 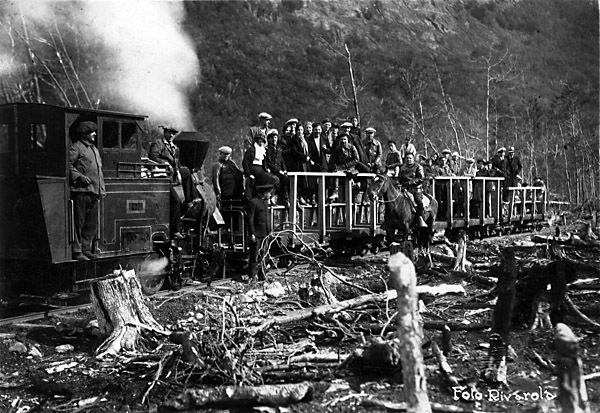 It is certainly possible that 60cm gauge temporary lines were used during the extension to Alto de las Plumas, as they were during the construction of the Esquel line, but no other evidence of this is known. The railway seems to have had a great variety of wagons. Remember that it was not solely a timber-carrying line, more a general transport system for each building in the prison, and indeed a carrier of merchandise along the length of the town. 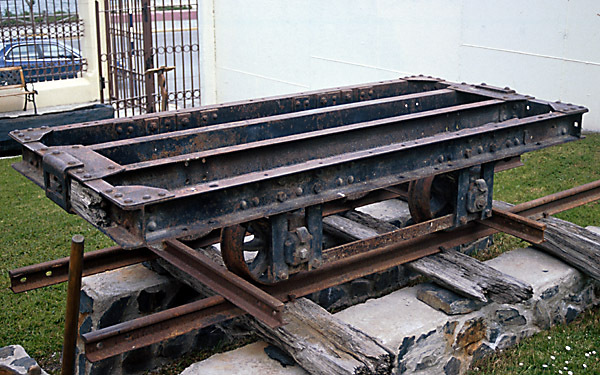 There were substantial bogie flats as in the picture above, sometimes fitted with high timber side frames to hold the loads in place. There were also large numbers of small skips, either with their tipper bodies, for ballast and other earth-moving, or without. 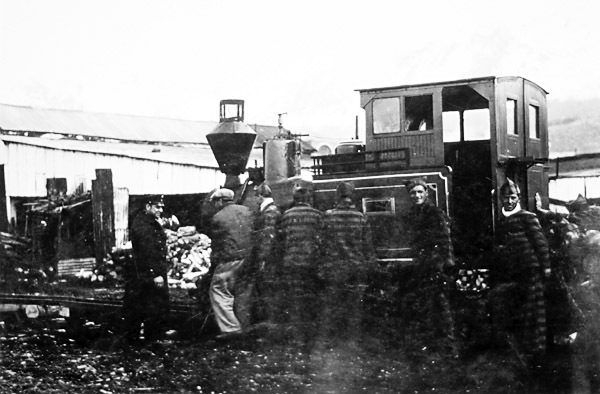 The photo below shows a train of them with flat platforms built to hold loads of stone and another photo shows one with a load of mutton carcases for the prison kitchens. 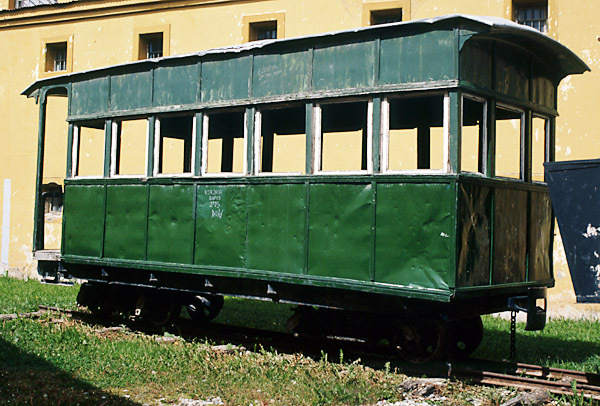 The only surviving wagon is a steel four-wheeled flat preserved in the garden of the Museo del Fin del Mundo on Calle Maipu. There seems to have been only one coach, apparently built in preparation for an expected, but unfulfilled visit from a state president. The suggestion that the coach was 'home-made' has been criticized from time to time on the grounds that it looks too professionally done. On the contrary, a prison has an endless variety of skills to call upon and it seems likely that this was built in the Presidio on a bogie wagon chassis. 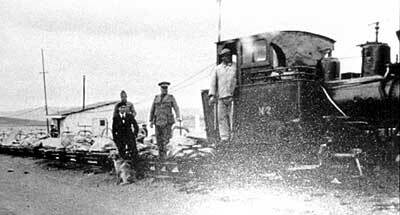 This is the only photo I have been able to find showing the coach on the railway's tracks. 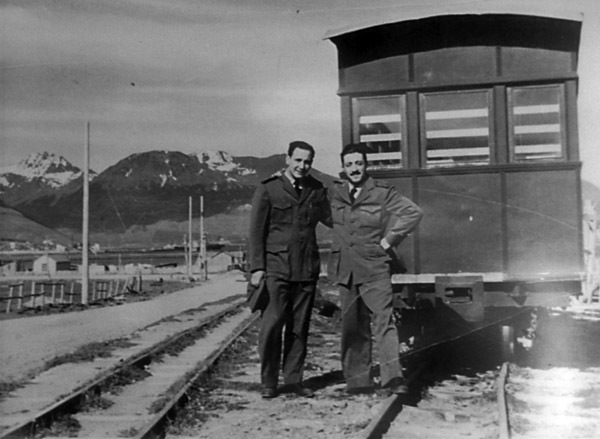 It is supposed to have been taken in 1952, just as the line closed. The weeds over the rails, and the style of uniforms, tend to support this. The coach survives, along with loco no. 2, and they are now in the grounds of the prison itself. 1 The Industrial Railways of Argentina - Stock lists. Revised edition 1998. Reg Carter. 46 Mill St., Kingston upon Thames, Surrey, KT1 2RF. UK. 2 Private correspondence from Señora Alicia Lazzaroni. 3 'Ushuaia la ergastula del sud', a parliamentary report on prison conditions first published in 1935. Not seen but quoted in a message from Augusto Gorni of Brazil to Sergio Barral and forwarded on to MCC for comment.